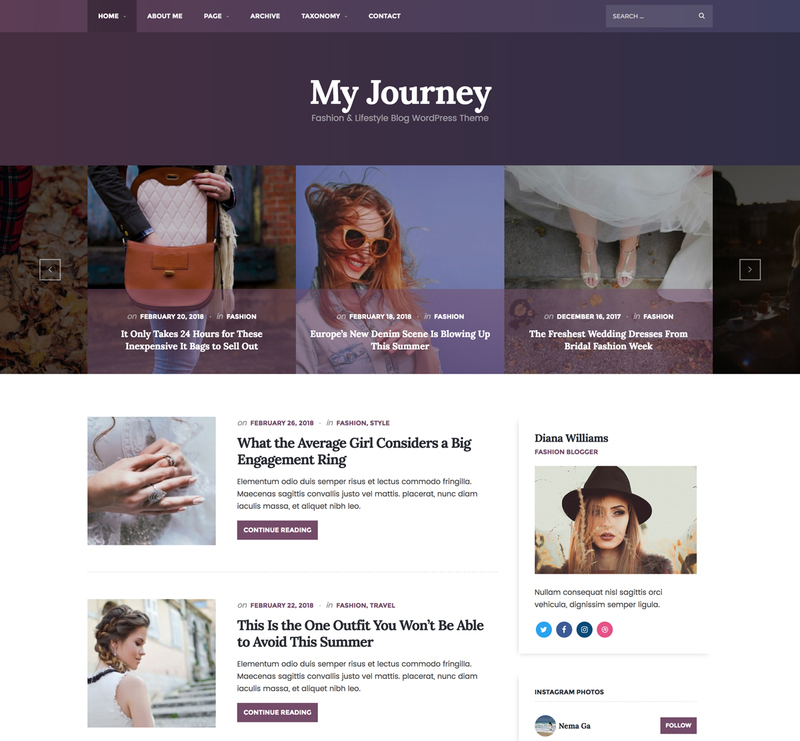 My Journey is a stylish WordPress theme made specifically for Personal, Fashion, Lifestyle Bloggers, as well as it may be used for any other subject matter. The theme is perfect for publishers and bloggers who want to share their passion, to write their stories and to build a colorful and eye-catching online project. 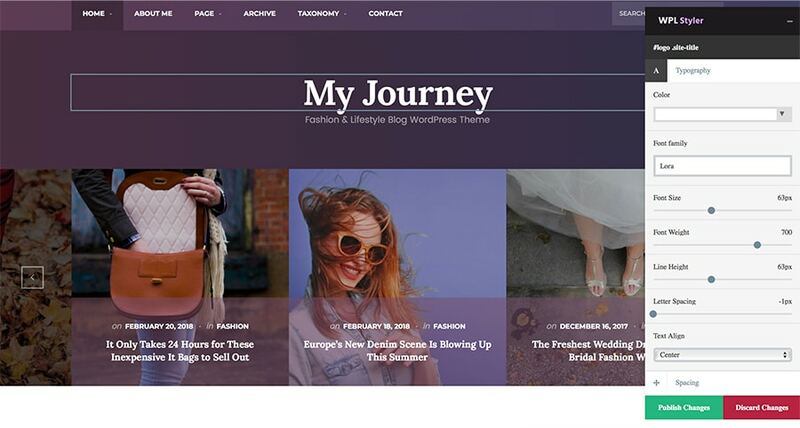 My Journey is a uniquely designed WordPress theme that will help you create a stylish and professional lifestyle blog. It looks modern, minimalist, and also supports social icons which will help your site to link with your social profiles. The theme is translation ready meaning you can create the language files and have the theme in your local language. My Journey has great features that you can use to give a unique feel to your personal blog and make it your own. My Journey theme comes with Styler, which makes it very easy to make changes ( fonts, colors, margins, etc. ) on pretty much any element without the need to know CSS or write CSS code yourself. The options are separated into different sections: Typography, Spacing, Background, Border. Blog archives are the heart of your blog. Thanks to the archive, your older posts can be found online at any time. Many visitors can browse old posts that they read, and learn about the topics your blog has. You can make your blog archives accessible by year and date with links to each post. The theme uses the WordPress Customizer feature for it’s global/theme options. It is entirely customizable, that means you will be able to manage and control every single feature and element of the website even with little or no relevant knowledge. Great design and support. I just bought this theme and as WP novice I can say it has a very nice design and is easy to use, little customization issues here and there but of course the customer support is great. I recommend! Support is very fast, theme is very nice thanks..